For Transect 3 of BRITICECHRONO, THE Irish Sea East, north from the terrestrial component in Shropshire-Lancashire, much of the remainder will be be dealt with during the marine cruises. The Isle of Man is the clear exception with excellent terrestrial exposure of the Quaternary geology; it is an excellent candidate region for dating the decline of the ISIS. The Isle of Man occupies a position astride successive ice advances through the Irish Sea Basin and records evidence of fluctuations of ice in the Irish Sea basin. 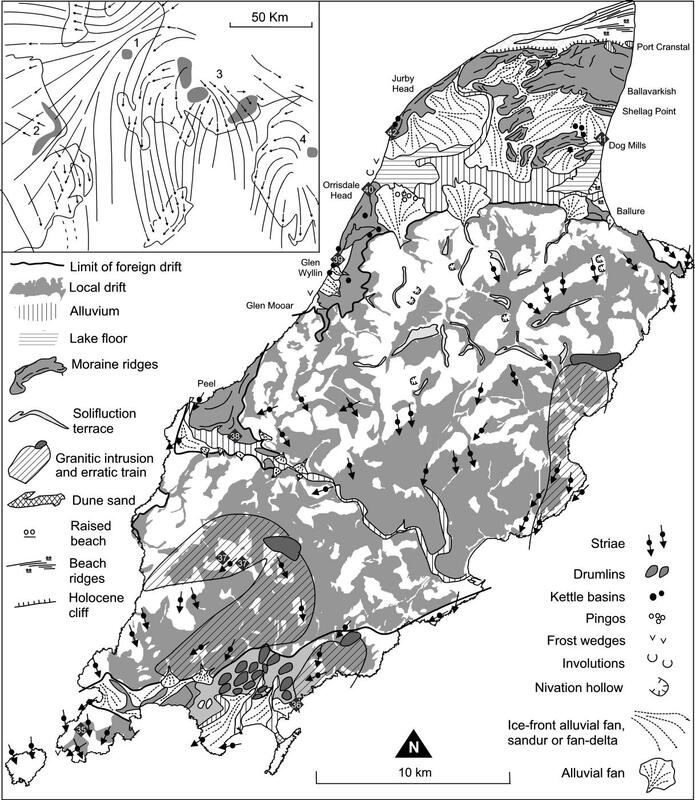 The glacial geology of the Isle of Man is extremely well known, and this knowledge forms the basis for recent BRITICECHRONO fieldwork on the Isle of Man. Team Isle of Man consisted of Richard Chiverrell, Matt Burke, Daniel Schillereff (all Liverpool University), and David Roberts (Durham University), with meticulous planning (and no hastily rearranged flights) the intrepid team took off for autumnal bedock, erratics, sands, Manx queenies, cliff sections, gravels, sands, buried soils (? ), kettlehole basins and ground penetrating radar on 4th to 9th November 2013….. We divided the Island five sectors documenting the northwards retreat, a) the Plains of Malew and adjacent hills (the South); b) the Peel embayment (the Central Valley) and on the northern plain c) outwash deposits of the Shellag Formation (the initial retreat); d) ice marginal sandar deposits associated with the Orrisdale Formation ice marginal oscillations (previously dated by Ian Thrasher) and e) outwash deposits of the Jurby Formations lain down during a more substantial 2-3km readvance. Together geochronology from these sectors would document the phased retreat across the Isle of Man and secure the timing of two well defined readvance episodes (Orrisdale and Jurby events). Day 1 Monday – Travel and reccie day for some: Roberts, Dave, was first to arrive, apparently having set off before dawn, from whence he set gainfully on reacquainting himself with some former haunts, having spent a happy 12 months on the Island as a post doc in the mid- to late 1990’s. A very good day followed, bedrock sites on the southern flanks of Man, and a search for the famous Foxdale erratic train….. Meanwhile following a 9am lecture to the second years on European peat climate records, Chiverrell (Rich) tried to find his unusually elusive postdoc, Burke (Matt) who had been set the not insignificant challenge of cramming too much equipment into a car that had now seen better days. But second success of the day followed, 2x GPR antennae, 1x RTK Trimble GPS, tripods and staffs, monolith tins, 3x gamma detectors, the Roberts Rocksaw and cosmo kit, luminescence tubes and gearing, plus two scientists, can fit…. Third success, catching the boat from Heysham to Douglas, only 60 mins early for check in this time….. By 10.30 we had all collected in Andreas in the far north of the Islands, via in Dave’s case some old haunts in Douglas and a fine meal in the Sulby Glen Hotel for Matt and Rich. Day 2 Tuesday – The Plain of Malew: The excellent recognisance by Dave helped us make short work of the very south of the Island. Bedrock samples a quartz arenite and quartz vein (sample 1 and 2) from Cregneash Peninsula overlooking the Calf of Man, where ice skirting the western flank of the Island has scoured and streamlined the topography and permission given by a very helpful landowner. The search for outwash sand and gravels for OSL proved slightly more taxing, with in the late afternoon a former bedrock quarry near Ronaldsway airport, Turkeyland Quarry, yielding a thin outwash deposit (sample 3) and a very enigmatic buried weathered soil, possible 14C target. And a fine dinner of Manx queenies and skate courtesy of chefs Matt and Dave. The final member, Schillereff (Dan), of the team flew in that evening to provide expertise on the kettlehole sediments, and revisit what might have been the locale for his undergraduate dissertation. Day 3 Wednesday – The Foxdale Granites and moving northwards:With permission from Manx National Heritage (Isle of Man Government) in order, the ‘holy grail’ site for BriticeChrono was very quickly lined up, the Foxdale granites. Ice flowing north to south penetrated through valleys from Glen Maye and Foxdale valley building to eventually bury and consume the Isle of Man. In Foxdale at the col at the head of the valley (~200m) a granitoid is exposed, and the erratic train holds a place of significance in the geological literature, including the attention of Charles Darwin (1842) as a classic example of transport of glacial boulders from low to higher ground including the summit of South Barrule. With the permission and assistance of Manx National Heritage several boulders were identified on the slopes of South Barrule near an Iron Age hillfort, 260-190m upslope and 1km distant from outcrop (samples 4 and 5). Foxdale granite is quite tough; boy did they take some chiselling. The four cosmogenic nuclide samples proposed for the Isle of Man form a coherent group in the south of the Island and a strong altitudinal gradient from 480m to 135m. There have been no previous attempts to obtain CN ages for the Isle of Man. Second success of the day, was Dan finding his kettlehole, perhaps not unexpected though given there are two on that stretch of coast with very similar stratigraphy. With the cosmogenic samples in the boot, Dave took his leave and departed for the UK. Day 4 Thursday – the Central Valley, Kirk Michael and Orrisdale: With Dave gone, OSL sampling was very much to the fore. First up the Central Valley of the Isle of Man extending Peel in the west to Douglas in the east, where geomorphology shows moraine ridges arcing north and northeast indicating penetration of ice from the coast. The Ballaharra sand and gravel quarry shows a 12m sequence comprising basal 12-4m gently dipping fore-set planar sands and massive stratified gravels overlain by an upper (4-0m) top-set channel of horizontally stratified gravels with interbeds of planar and planar rippled sands. Western sectors of the current exposures are dominated by glacial diamicts and testify to an ice marginal setting. The sequence described is an ice proximal delta, with an ice contact slope immediately behind the worked exposures (samples 6 and 7). The late morning, saw a confrontation with high tides, the tides won. Slightly later, we began our run through the three retreat stage formations exposed on the Northern Plain of the Isle of Man. First Shellag Formation outwash at Kirk Michael (sample 8), with us filling the time taken to collect gamma dosimetry with sample the Kirk Michael (KM3/4) kettlehole deposits for our tephrachronologists to search for Icelandic volcanic ash layers. The KM3/4 kettlehole includes a basal cold stage lake muds that predate the lateglacial warming (sample 9). The Orrisdale Formation on the Island is quite well dated, with Ian Thrasher’s research, but we selected the northern most sandur trough in the sequence for further work (sample 10-11). Day 5 Friday – Jurby Readvance and the Dog Mills: The final day of OSL sampling, we tackled the Jurby Readvance, with two good lithofacies in off-lapping readvance over-ride sequence 3 (samples 12-13), just below a phenomenally well exposure kettlehole, including a prograding delta into the basin (one for the Quaternary community to revisit). The last sample of the day, on the east coast, the Dog Mills proglacial lagoonal sands (sample 14). Thus the sampling over 4-5 days spans the entire retreat sequence on the Isle of Man and two readvance episodes. Day 6 Saturday – Bride and seeing what you can do with GPR: With everything complete samples wise, the spare day was just that and with a 19.30 hours departure giving us some leisure time….. What do two Quaternary Geologists with a day spare? Well with 2x GPR antennae and a GPS set up, we assess the performance of GPR for Irish Sea glacigenic lithologies using the Bride Moraine, arguably one of the best if not the best exposure of glacitectonics on the NW European Archipelago. Do we need to know the internal structure of Bride? ; well we could just go and look at the 60-80m high cliff sections or read a GSP Thomas paper for that. Again with helpful landowners guiding the way, we gained access to the cliff-tops above Bride, and surveyed 2.5km of the most undulating glacigenic terrain you could hope to meet. The very promising results in hand; we then also set sail for home….. This entry was posted in General chat, Geochronology specific issues, Terrestrial geology specific issues and tagged fieldwork, geochronology, glaciation, Irish Sea, lacustrine, OSL, T3, transect 3 on November 17, 2013 by briticechrono.